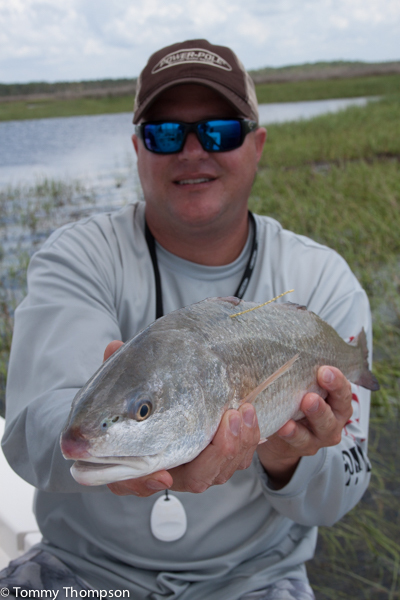 Gulf Anglers–Don’t Forget To Register For CCA-Florida’s 2015 STAR Tournament! CCA Florida’s Executive Director, Brian Gorski, prepares to release a tagged redfish on Florida’s Natural North Florida coastline. Just a reminder for everyone to register for the CCA STAR Tournament. The Tournament runs until Labor Day 2015 and still has some fabulous prizes, valued at about $500,000. That’s a bunch of money and with more than 120 tagged redfish distributed along the Gulf coast, everyone has a chance to win. And there are prizes for fish other than reds. Simply download the smartphone app and register any fish/any species throughout the Tournament to be eligible for a drawing. As of June 1, six tagged redfish have been caught. Four anglers called after catching tagged fish but were disappointed to miss the free truck, as they hadn’t entered. And one cleaned the fish before finding the tag! However, one angler, Jerry Bergeron, caught a tagged fish in Cockroach Bay, south of Tampa, and is the winner of the 2015 GMC 1500 Crew Cab truck from Conley Buick/GMC! There are still plenty of fish between Yankeetown and Panacea, just waiting for someone in our area to cash in! Prizes still include boats, motors, trailers as well as about $100,000 in scholarships for winners in the kids’ category. BUT FAIR WARNING—if you don’t enter, you can’t win. Don’t be the poor soul who shows up at the dock with a winning, tagged, redfish and didn’t winner. If you’re already a CCA member, your entry costs only $30. If you’re not a member, your $60 entry fee gets you a one-year CCA membership along with Tournament eligibility. For completer information, rules, prize lists and registration information, go online to CCA Florida’s STAR website.